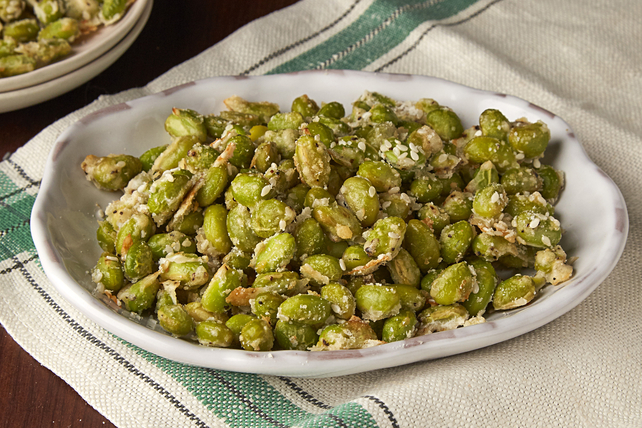 Impress them all at snack time with our Roasted Parmesan Edamame recipe. Roasted Parmesan Edamame is a flavourful and easy-to-prepare recipe. Microwave edamame in microwaveable bowl on HIGH 2 min. or until thawed. Pat dry with paper towel. Whisk all remaining ingredients except sesame seed in medium bowl until blended. Add edamame; mix lightly. Cover rimmed baking sheet with foil; spray with cooking spray. Spread edamame onto prepared baking sheet; sprinkle with sesame seed. Bake 22 to 25 min. or until edamame is crisp and golden brown, stirring every 10 min. to break up any large pieces. Cool slightly. Prepare using black sesame seed.